Old Jack Cole was a merry old soul. 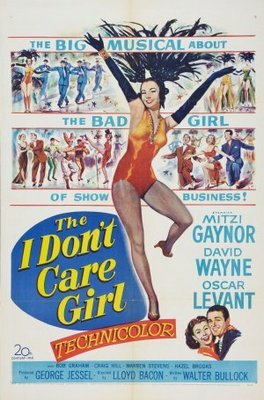 Regular Shadowplayer La Faustin pointed me in the direction of THE I DON’T CARE GIRL, an iffy MGM Fox musical with some spectacular musical numbers by Jack Cole. Cole is famous for directing the songs in GENTLEMEN PREFER BLONDES and LES GIRLS and SOME LIKE IT HOT, but turned loose on a full MGM musical (though produced not by Arthur Freed but by comedian George Jessel, who appears as himself) he excels himself. I don’t really know Mitzi Gaynor much. But she can dance. Number one features Oscar Levant, MGM’s resident intellectual. Number two features Levant again, and David Wayne, the child-killer from Losey’s M. They make pretty good combination, better than FEATHERS and FIRE, anyway — was Cole plotting to assassinate his star? I quite like this song, but the lyric “I’m Eva Tanguay / I don’t give a hang(way)” is really unforgivable. In number three, you may be able to spot Gwen Verdon and Julie Newmar.